9th version of the interactive E Wall by Matthias Oostrik. This wall is inspired by the Liquid Light Shows from the 60’s and based on scientific fluid dynamics algorithms. The 6th version of the Wall received the 2010 Dutch Design award for best product in public space. The software behind this installation is now made opensource and can be found on github. Matthias Oostrik |1980| is a computer artist, interaction designer and software developer based in Amsterdam. 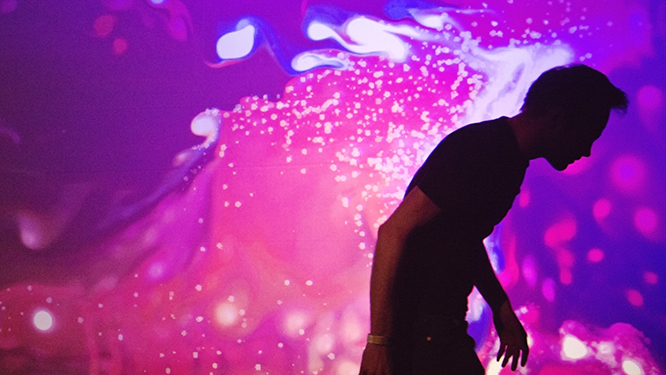 Oostrik creates audiovisual installations that explore the interplay between the audience and technology. Oostrik collaborated with artist and scientist, including Marina Abramovic, Raphael Diluzio and Suzanne Dikker. In recent years his work was shown at Lexus Hybrid Art Fair (RU), Silicon Valley Contemporary (US), EYE (NL), Soft Control (SI), Mapping Festival (CH) and TodaysArt (NL).